Beginning this fall, Tufts is launching a partnership with MyBusHome, a small private company which contracts with major coach fleets to provide buses on major school breaks, thereby reducing the need for hundreds of parents to make individual trips to pick up their kids. The pilot run for the program will occur in October over the Indigenous People’s Day long weekend. Destinations will include Albany, NY; Portland, ME; Philadelphia, PA; and New York, NY. These cities were chosen through an analysis of the demographics of the student body in the Northeast and Mid-Atlantic. The partnership aims to fill gaps in availability, affordability, or convenience of mass transit options. The buses will have a lower carbon impact than if students were to be driven to and from school by their parents or guardians. Buses are also scheduled for Thanksgiving, the winter break, and the spring break. Tickets can be purchased at MyBusHome.com. MyBusHome will be processing all payments, ticketing, and questions. In April, the Grafton campus celebrated Zero Waste Week for the first time ever, joining Medford in challenging the Tufts community to recognize one’s personal footprint and reduce it. About 30 people signed up for the challenge, which involves carrying any waste which cannot be recycled, composted, or avoided in a plastic bag clipped to one’s backpack or handbag for a full week. Participants included students from all years, interns and residents at the hospitals, and faculty. 15 participants made it to the end of the challenge, delivered their bags to the Earth Day event, and received their prize. All participants were entered into a raffle for an earth-friendly gift, which was ultimately won by Whitney Stiehler from Wildlife. Whitney Stiehler won these hip reusable lunch containers, which make eating on the go, at your desk, or at Zero Waste events easier than ever. After the challenge, participants reported that the exercise led them to think more about what products they were using and how everything could be disposed; they also praised the accessibility of recycling and composting on the campus for making the challenge more doable. The Grafton campus also celebrated Earth Day with its annual tree planting next to the Agnes Varis Campus Center. Trees are planted in honor of Earth Day. Beginning this fall, the free campus shuttle which runs a loop along Boston Avenue on the Medford/Somerville campus will add a stop at the Whole Foods store on Mystic Valley Parkway. Though there are several groceries stores near campus readily accessible by car, reaching them by foot or by bike — and returning with a load of groceries — can be difficult, inconvenient, and time-consuming. The new shuttle stop will provide students with another option for fresh produce and other healthy food and make doing errands simpler and more sustainable. 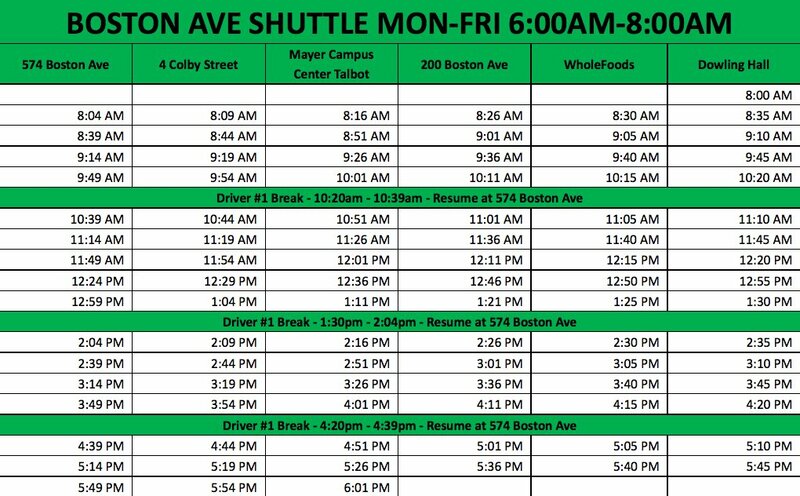 The revised schedule will also include a stop at the Mayer Campus Center, thereby linking the Boston Ave and Davis Square shuttles and making travel between the different sectors of campus and its surroundings more feasible. Recycling interns Alex Cherry and Megan Mooney worked with Administrative Services to make the change possible. Cherry notes that Whole Foods offers a bottle and can return station and hopes students will use the shuttle for that service as well. Administrative Services hosts information about shuttle schedules and the shuttle tracker app. The shuttles will begin operating once the school year starts, but the Boston Ave shuttle is available here.